Description: The Play Family Farm was the very first play-and-carry Little People set. "Play-and-carry" meaning that it is a closeable building that houses all of the accessories and features a handle to take the set on the go. This set proved to be an instant success and the Little People sets that Fisher-Price had been producing in the early 60's were soon put aside in favor of more play-and-carry sets. The farm's accessories changed many times during it's long production line...it is a nightmare trying to keep up with the variations, espically with all of the jointed animal variations (metal rivet or not, "MADE IN HONG KONG" or not, etc). 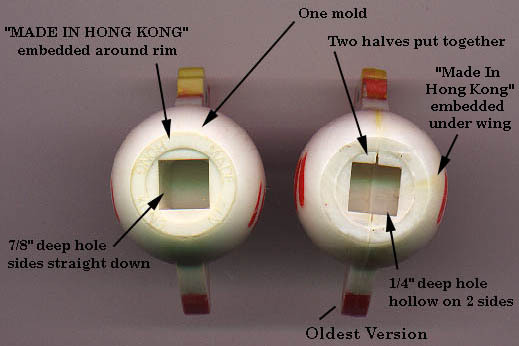 The base maintained it's basic shape during this time, but small details were changed, such as minor litho designs, roof types and base materials, described below in the "variations" section. The farm building always has 2 barn doors on the front that close together with a plastic hook. When the left barn door is opened, it makes a "moo-moo" sound. There are 2 plastic hay loft doors above the barn doors, and a hinged plastic carrying handle on top. B915M1 - Farm Base - Barn with a masonite base and a smooth white plastic roof with pointed corners. The barn walls have red paper lithos with white verticle lines, barn decorations, a Fisher-Price logo, and "915". The front has 2 red barn doors with a white "X" on each door, and with a metal rivet on the barn door handle. The left-side door makes a cow-like "moo" sound when opened or closed. The barn has a hay loft with 2 small white plastic hayloft doors above the big barn doors. Measures 11" wide x 7" deep x 8-3/4" tall. FPT932 - Silo - Round metal base cylinder with cardboard side covered by red printed litho. Litho has a BROWN FARM DOOR and BABY SUNFLOWERS images on the sides. Marked "915" on farm door; c/r '68 on bottom. Overall size: 4-3/8" diameter x 7-1/4" tall. FPT934 - Silo Lid - Round white plastic pointed top lid that fits into a silo bases and forms the "roof" of the silo. Lid has SMOOTH sides and 1 small window on the side. Overall size: 5" diameter x 3-1/2" tall. FPT469 - Yellow tractor with 2 large Orange/Red back wheels. Has a litho on the engine that has a GREY background, 3 dots (red, yellow, and blue), and a BLACK line above the dots. Front 2 wheels held on via YELLOW plastic rivets and the wheels are marked "FISHER-PRICE TOYS". FPT481 - Red cart with Yellow plastic axles, wheels marked "Fisher-Price Toys". 4 each - FPT237 - White plastic farmyard style fence section with an old style "KNIFE-WHITTLED" finish. The fence has two horizontal beams set across three vertical upright posts. WM - White cow with brown spots, brown ears and a brown tail. XH - Black horse with a white mane and tail, white facial markings, and white "socks" above his black hooves. UJ - Light brown dog with white body spots and facial details. His ears and tail are black. YR - White sheep with 2 black ears, a black face and 4 black legs. YI - Black pig with white ears and facial markings. *See Variations below. APWW - Farmer dad - Blue farmer with a yellow cowboy hat and an orange triangle scarf. HEWW - Mom - Yellow mom with fancy eyes and white hair in a bun. ALWW - Farmer Boy - Blue boy with a yellow cowboy hat. FVWW - Girl - Green girl with red braids, red freckles, and black "" eyebrows. Red tractor with 2 big yellow plastic back wheels and 2 small black plastic front wheels. The tractor has a small litho attached to both sides of the "engine". This litho has a black bar across the bottom and 3 colored dots above it (blue, yellow and red). FPT477 - Yellow cart with Red plastic axles, wheels marked "Fisher-Price Toys". ZE - Dark brown horse with a black mane and tail and white "socks" above his black hooves. AKWW - Farmer dad - Blue farmer with a red cowboy hat and a yellow triangle scarf. WG - Black cow with white body spots, ears, and tail. WS - Black dog with white spots, white ears, white body spots, and a white tail. *See Variations below. YQ - Black sheep with black ears and white dot eyes. YO - White pig with brown ears and black dot eyes. AJWW - Farmer Boy - Blue boy with a red cowboy hat. WI - Brown cow with white spots, white facial markings, black ears, and a black tail. XR - White horse with black facial markings and a light brown mane and tail. *See Variations below. YL - Brown pig with black ears and facial markings. FUWW - Girl - Green girl with blonde braids, red freckles and black "" eyebrows. WM or WN - White cow with brown spots, ears and tail. ZE or UM - Dark brown horse with a black mane, tail, and facial markings. *See Variations below. WU or WV - Dark brown dog with white body spots, black facial features, black ears, and a black tail. YI or YJ - Black pig with white ears and white dot eyes. *See Variations below. FUWW - Girl - Green girl with blonde braids, red freckles, and black """ eyebrows. AKWW or AKWP - Farmer dad - Blue farmer with a red cowboy hat and a yellow triangle scarf. HEWW or HEWP - Mom - Yellow mom with fancy eyes and white hair in a bun. AJWW or AJWP - Farmer Boy - Blue boy with a red cowboy hat. FUWW or FUWP - Girl - Green girl with blonde braids, red freckles and black """ eyebrows. WN - White cow with brown spots, ears and tail. UM - Dark brown horse with a black mane, tail, and facial markings. *See Variations below. UI - Dark brown dog with white spots, black facial features, black ears, and a black tail. This dog also has a discolored (extra dark brown) right left leg. YJ - Black pig with white ears and white dot eyes. *See Variations below. APWP - Farmer dad - Farmer with a yellow cowboy hat and an orange triangle scarf. HEWP - Mom - Yellow mom with fancy eyes and white hair in a bun. ALWP - Farmer Boy - Blue boy with a yellow cowboy hat. FVWP - Girl - Green girl with red braids, red freckles, and black """ eyebrows. WN or WO - White cow with brown spots, ears and tail. UM or UN - Dark brown horse with a black mane, tail, and facial markings. *See Variations below. WV or ZG - Dark brown dog with white spots, black facial features, black ears, and a black tail. *See Variations below. YS or YT - White sheep with black ears, black face, and 4 black legs. YJ or YM - Black pig with white ears and white dot eyes. *See Variations below. AKWP or AKPP - Farmer dad - Farmer with a red cowboy hat and a yellow triangle scarf. HEWP or HEPP - Mom - Yellow mom with fancy eyes and white hair in a bun. DQWP or DQPP - Farmer Boy - Red (deep red) boy with a yellow cowboy hat. FUWP or FUPP - Girl - Green girl with blonde braids, red freckles, and black """ eyebrows. ZH - Dark brown dog with white spots, black facial features, black ears, and a black tail. *See Variations below. YK - Black pig with white ears and white dot eyes. APPP - Farmer dad - Farmer with a yellow cowboy hat and an orange triangle scarf. HEPP - Mom - Yellow mom with fancy eyes and white hair in a bun. ALPP - Farmer Boy - Blue boy with a yellow cowboy hat. LAPP - Girl - Green girl with a brown sculpted bob, red freckles, and black """ eyebrows. B915M2 - Farm Base - Barn with a masonite base and a smooth white plastic roof with pointed corners. The barn walls have red paper lithos with white verticle lines, barn decorations, a Fisher-Price logo, and "915". The front has 2 red barn doors with a white "X" on each door, and without a metal rivet on the barn door handle. The left-side door makes a cow-like "moo" sound when opened or closed. The barn has a hay loft with 2 small white plastic hayloft doors above the big barn doors. Measures 11" wide x 7" deep x 8-3/4" tall. B915P1W - Base - Barn with a green plastic base and a smooth white plastic roof with pointed corners. The barn walls have red paper lithos with white verticle lines, barn decorations, a Fisher-Price logo, and "915". The front has 2 red barn doors with a white "X" on each door. The left-side door makes a cow-like "moo" sound when opened or closed. The barn has a hay loft with 2 small white plastic hayloft doors above the big barn doors. Measures 11" wide, 7-7/8" deep and 8-7/8" high. *See "Variations" below. FFPP - In addition to the green girl, the 1980 and 1981 Fisher-Price catalogues also shows a blue girl with a brown sculpted bob. This blue girl is probably a protographers mistake because as far as we know, this set was always sold with only one boy and one girl. However, the 1980 catalogue pictures the barn set with a green plastic and the 2 girls mentioned above. The 1981 catalogue reverts back to the masonite base, but still pictures the same 2 girls mentioned above. B915R1W - Base - Barn with a green plastic base and a smooth white plastic roof with rounded corners. The barn walls have red paper lithos with white verticle lines, barn decorations, a Fisher-Price logo, and "915". The front has 2 red barn doors with a white "X" on each door. The left-side door makes a cow-like "moo" sound when opened or closed. The barn has a hay loft with 2 small white plastic hayloft doors above the big barn doors. Measures 11" wide, 7-7/8" deep and 8-7/8" high. *See "Variations" below. XN - Dark brown horse with a black mane, tail, and facial features. The eyes have eyelashes. ANPP - Farmer dad - Blue farmer with a yellow cowboy hat and an orange non-triangle scarf. B915P3 - Base - Barn with a brown plastic base and a smooth white plastic roof with rounded corners. The barn walls have red paper lithos with white verticle lines, barn decorations, a Fisher-Price logo and #915. The front has 2 red barn doors with a white "X" on each door. The left-side door makes a cow-like "moo" sound when opened or closed. The barn has a hay loft with 2 small white plastic doors above the big barn doors. Measures 11" wide, 7-7/8" deep and 8-7/8" high. 1969-1976 - B915M1 - Farm Base - Barn with a masonite base and a smooth white plastic roof with pointed corners. The barn walls have red paper lithos with white verticle lines, barn decorations, a Fisher-Price logo, and "915". The front has 2 red barn doors with a white "X" on each door, and with a metal rivet on the barn door handle. The left-side door makes a cow-like "moo" sound when opened or closed. The barn has a hay loft with 2 small white plastic hayloft doors above the big barn doors. Measures 11" wide x 7" deep x 8-3/4" tall. 1977-1978 - B915M2 - Farm Base - Barn with a masonite base and a smooth white plastic roof with pointed corners. The barn walls have red paper lithos with white verticle lines, barn decorations, a Fisher-Price logo, and "915". The front has 2 red barn doors with a white "X" on each door, and without a metal rivet on the barn door handle. The left-side door makes a cow-like "moo" sound when opened or closed. The barn has a hay loft with 2 small white plastic hayloft doors above the big barn doors. Measures 11" wide x 7" deep x 8-3/4" tall. 1979-1981 - B915P1R - Base - Barn with a green plastic base and a smooth white plastic roof with pointed corners. The barn walls have red paper lithos with white verticle lines, barn decorations, a Fisher-Price logo, and "915". The front has 2 red barn doors with a white "X" on each door. The left-side door makes a cow-like "moo" sound when opened or closed. The barn has a hay loft with 2 small red plastic hayloft doors above the big barn doors. Measures 11" wide, 7-7/8" deep and 8-7/8" high. 1982-1985 - B915R1R - Barn with a green plastic base and a smooth white plastic roof with rounded corners. The barn walls have red paper lithos with white verticle lines, barn decorations, a Fisher-Price logo, and "915". The front has 2 red barn doors with a white "X" on each door. The left-side door makes a cow-like "moo" sound when opened or closed. The barn has a hay loft with 2 small red plastic hayloft doors above the big barn doors. Measures 11" wide, 7-7/8" deep and 8-7/8" high. 1985 Sears Exclusive - B915P3 - Base - Barn with a brown plastic base and a smooth white plastic roof with rounded corners. The barn walls have red paper lithos with white verticle lines, barn decorations, a Fisher-Price logo and #915. The front has 2 red barn doors with a white "X" on each door. The left-side door makes a cow-like "moo" sound when opened or closed. The barn has a hay loft with 2 small white plastic doors above the big barn doors. Measures 11" wide, 7-7/8" deep and 8-7/8" high. FPT1092 - Round metal base cylinder with cardboard side covered by red printed litho. Litho has a RED FARM DOOR/NO SUNFLOWERS image on the sides. Overall size: 4-3/8" diameter x 7-1/4" tall. XQ - The white 1971 JC Penny's exclusive horse could also have brown facial markings opposed to black. UO - The dark brown horse with a smooth belly could also had been marked "MADE IN TAIWAN" opposed to "MADE IN HONG KONG". XO - With a metal rivet through his belly, and the words "MADE IN HONG KONG". ZF - With a circular depression on his belly where a metal rivet used to be, and the words "MADE IN HONG KONG". XP - With a smooth belly, and the words "MADE IN HONG KONG". UQ - With a smooth belly, and the words "MADE IN HONG KONG", and eyes with eyelashes. US - The 1971 black dog could also have black ears opposed to white ears. WY - The 1971 dog could also be white with brown ears, brown body spots, brown facial marking, and a brown tail. WW - With a circular depression on his belly where a metal rivet used to be, and the words "MADE IN HONG KONG". UK - With a smooth belly, and the words "MADE IN HONG KONG". YE - Black pig with dark greyish-brown ears. He has a metal rivet through his belly and no words. YF - Black pig with dark greyish-brown ears. He has a metal rivet through his belly and the words "MADE IN HONG KONG". YG - Black pig with light grey ears. He has a metal rivet through his belly and no words. YH - Black pig with light grey ears. He has a metal rivet through his belly and the words "MADE IN HONG KONG". FP915SET1968 - Complete set in original box. WFL: BW. FP915BOX1984 (Box ONLY) - This set was sold in a 17" long, 10-3/8" high, 7-5/8" deep box. FP915SET1984 - Complete set in original box. Also see Europe's #910 Fisher-Price Farm. 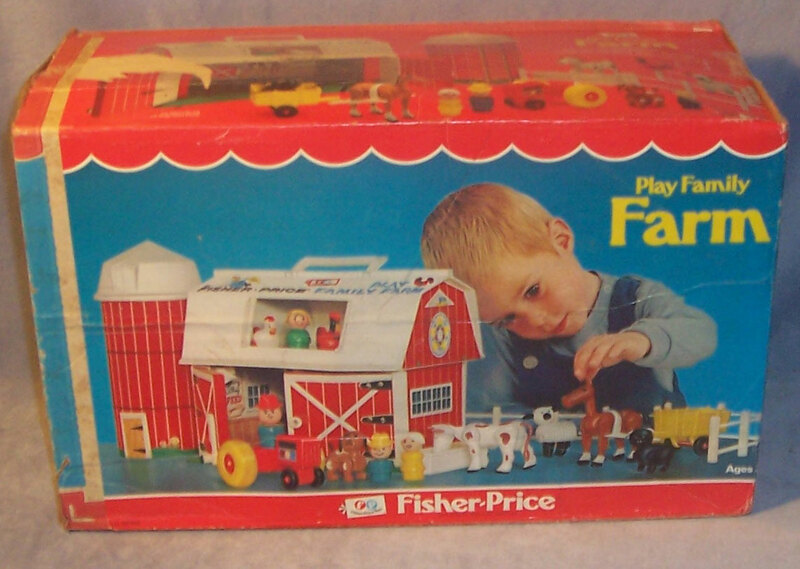 In 1986 Fisher-Price reissued a "new" barn set as #2501 Little People Farm. This set comes with a ribbed-roof barn and silo. The barn has a green plastic base, and red hayloft doors. Also see #33 Farm Display.